SeaWorld Hopes New Orca Habitats Will Stem A Tide Of Criticism The theme park says a 2013 documentary critical of its captive orca attraction has hurt its bottom line. Now, it's pushing back with a social media campaign and plans for new habitats for its whales. Visitors watch an orca performance at SeaWorld in San Diego this year. The company has seen attendance slip in the year since the release of a documentary film critical of the company's captive whale program. The company, which has parks in San Diego, San Antonio and Orlando, Fla., saw its attendance drop in recent months. The company blames that, in part, on fallout from Blackfish, a documentary film that's critical of SeaWorld's treatment of its captive killer whales. Now, SeaWorld is trying to put Blackfish behind it, announcing plans for an expansive new orca habitat in its parks. Even so, critics say the planned moves don't go far enough — the entire industry, they argue, needs to move away from profiting from animals in captivity. When the midday show ends at SeaWorld's Shamu Stadium in the Orlando park, a few thousand visitors stream for the exits. The show's over, but SeaWorld trainers are still working with the animals that are the park's main attraction: its captive orcas, also known as killer whales. They jump out of the water onto a "slide out" where they interact with trainers, based on hand signals. Tilikum, a large male, is SeaWorld's best-known orca. He's been involved in the deaths of three people — the most recent being trainer Dawn Brancheau, who was killed in 2010. That incident is the centerpiece of Blackfish. In the film, critics such as former trainer Samantha Berg question SeaWorld's business model: using captive killer whales as attractions in popular entertainment. "It's time to stop forcing the animals to perform in basically a circus environment. And they should release the animals that are young enough and healthy enough to be released," Berg says in the film. "And the animals like Tilikum, who are old and sick and have put in 25 years in the industry, should be released to an open ocean pen." 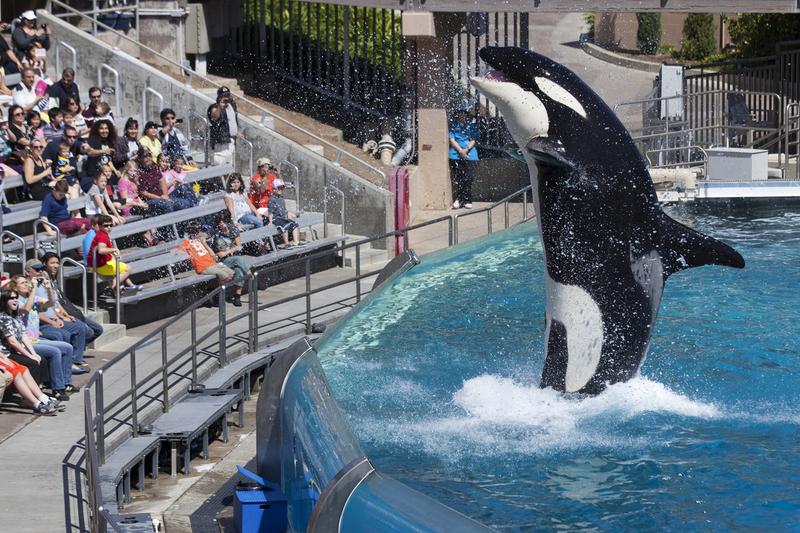 SeaWorld said little when the documentary debuted last year. But after CNN acquired Blackfish last fall, things changed. The network aired the film more than a dozen times — bringing it, CNN says, to tens of millions of viewers. Perhaps even more damaging to SeaWorld, lawmakers in California took up a bill this spring that would ban using killer whales in shows. SeaWorld lobbied hard against the proposed law and it was tabled. The company began a vigorous campaign on the Web and social media in December. SeaWorld's head veterinarian, Christopher Dold, says that was a great day for him and other staff, because it marked the moment when the company finally began telling its side of the story. "The frustrating thing is that, at the root of the criticism, is this sense that we don't care — that we're heartless in our approach to the care of these animals," Dold says. "And that's the main thing that is wildly off-base. We obsess about this." Over the past several months, while other theme parks did well, SeaWorld's attendance declined. Last month, the company finally conceded what many had suspected: that the debate over captive killer whales was hurting its bottom line. The company's stock price plummeted by a third. Tuna Amobi, an entertainment analyst for Standard & Poor's Equity Research, says he believes SeaWorld will eventually overcome its current problems and is still a good investment. "The belief is that this sentiment will wear out, and the valuation at this level seems relatively attractive, given the declines that we've seen," he says. Days after its steep stock drop, SeaWorld took a step toward repairing its public image, with the announcement of a new environment for its whales. The new project, called Blue World, will greatly expand the orcas' habitat, Dold says. It will also add oceanlike currents and other features designed to stimulate and challenge the whales. "This is the best viewpoint and vantage point to see that where our whales live today is a series of large pools," Dold says, standing at the edge of a pool in Shamu Stadium. "A very large habitat and facility. And Blue World is about doubling this entire space." The expansion will cost hundreds of millions of dollars, with the first SeaWorld phase planned for the San Diego park. Tim Zimmermann, a writer for Outside magazine and an associate producer of Blackfish, says SeaWorld seems to be acknowledging that the pools it's been using are inadequate. But the plans still sidestep key issues, he says. "Nothing about enlarging the pools will deal with the stress and health issues associated with captivity. So, to me, enlarging the pools shows that they understand there's a problem with the environment," he says. "But really what they're doing is tweaking their captivity model, as opposed to really taking a close look at how they could reinvent it or even transition away from it," he adds. SeaWorld doesn't expect to open its new orca habitat in San Diego until 2018. In the meantime, it's facing a new challenge. This week, some SeaWorld shareholders filed suit against the company, claiming that it lied about earlier attendance declines and its treatment of killer whales.